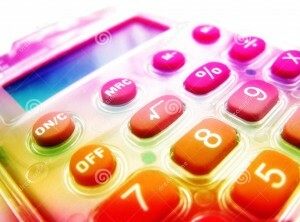 Home / DIY Gel Nails • Nail Lamps / Free Calculator Tool: How Much Money Can DIY Nails Save You? I love the feeling of leaving a salon with freshly painted nails but I unfortunately don’t have the money or time to spend several hours getting my nails done every other week. I was spending $25-$35 plus tips for each visit to the salon. Thirty-five dollars here and there doesn’t seem too bad, but when you look at the cost over one year it’s shocking – 2 salon visits per month translates to $840 per year!! And…this does not include what’s saved by also doing your own pedicures since most likely, you will do both at the same time! Based on a charge of $65 for a mani/pedi combo, this savings can quickly morph to $1,400 or more. Sounds like a pretty nice vacation trade off to me! After spending $150 on a nail lamp and nail polishes, I saved $690 over the last year by switching to DIY nails!! I can now do my own gel/shellac manicures at home in less than 30 minutes and the manicure lasts without chipping for 2 weeks. Use this handy DIY manicure cost savings calculator tool to see how much money you can save by going DIY. Choose a reliable and professional nail lamp – they can last up to 10 years! through Google, and discovered that it’s genuinely informative. on. Lots of people will be taking advantage of your writing. Thank You! I just took over this site from my amazing daughter, Amanda and look forward to making this a comprehensive DIY nails resource for everyone. Let me know if there is something you would like for me to include!